In August 2003, an unusually dark blue beryl was discovered in Canada's Yukon Territory. The new beryl, noteworthy for its dark blue color and strong dichroism from blue to nearly colorless, is being referred to as "True Blue" beryl. 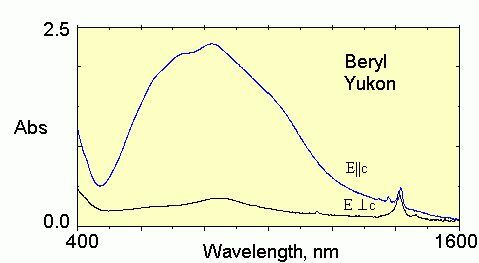 The beryl have iron contents ranging from 1.5 to 5.8 wt% FeO, the highest value for Fe in beryl yet reported. Close-up view of blue beryl on matrix. The optical spectrum is generally like other aquamarines, but the intensity of absorption is greater.